It’s too late if you didn’t see the promotion because it ended today. I only found out about it because I did my health screening at Bangkok Hospital Korat last year and they sent an SMS message to past patients about the price reduction. 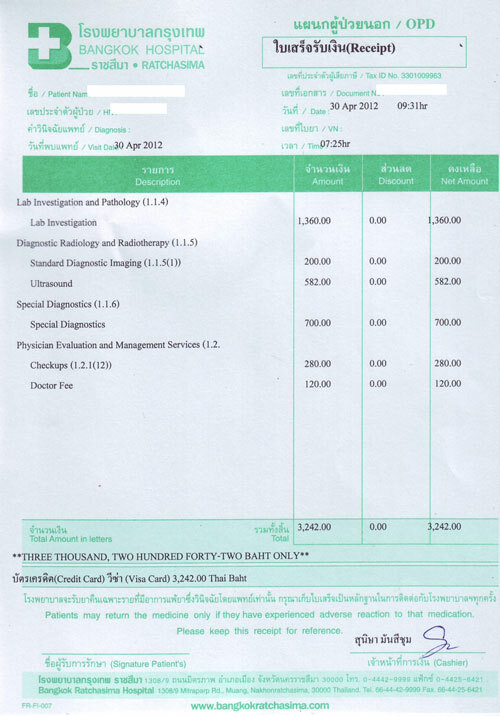 The so called VIP health screening package, normally about 9,000 baht, was being offered for about 3,200 baht from April 27 through April 30. I get my annual health screening every year about this time so I got in on the last day of the special pricing. There is another higher priced package that includes exercise stress test and some additional lab work. But I didn’t feel the need for that package and it was not discounted anyway so I went with the VIP plan. The blood work included the basics. Hematology: complete blood count, white blood count, red cell morphology. Blood chemistry: fasting blood sugar, HbA1c, cholesterol levels, uric acid, creatinine, SGPT. The higher priced plan includes additional liver function as well as thryoid tests. But this plan did include testing for liver cancer and prostate cancer markers. Something new was added to the EKG this year that I didn’t have before. It was called a ciculation test. In addition to the EKG electrodes being attached to me, blood pressure cuffs were put around both biceps and calves. After the EKG was run the pressure cuffs alternated filling and emptying in different sequences. The report was an interesting chart that appeared to indicate blood pressure in different extremeties as the sequence was run. The doctor reviewed it and said everything was normal but the chart wasn’t included in the report folder – I wish I had asked for it. The service was quite good this time. Last year I was somewhat displeased with the way they handled the report – it was mailed two weeks later and was incomplete, requiring a followup call to get the complete report remailed. This time the bound report was handed to me before I left the hospital. The tests went quickly as well, probably because I arrive very early before it got busy. And the doctor spent plenty of time talking with me about the results and answering any questions I had. And here is a copy of the receipt, totaling 3,242 baht. A very good deal. It does give one a bit of a chuckle to see the doctor fee listed as all of 120 baht (US$4)! This entry was posted on Monday, April 30th, 2012 at 9:30 pm	and is filed under Health Screening. You can follow any responses to this entry through the RSS 2.0 feed. Both comments and pings are currently closed.